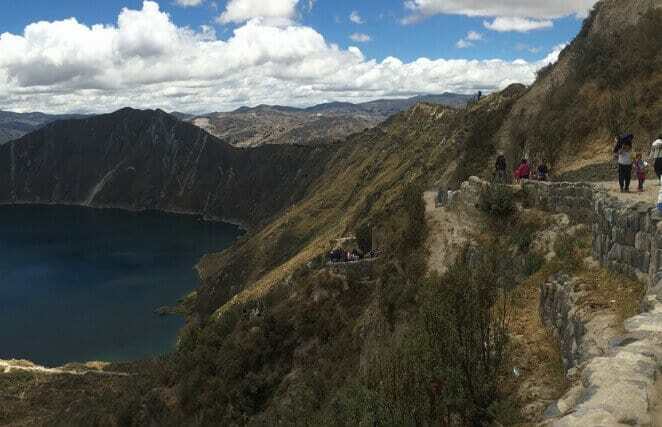 Quilotoa Lagoon 2019 Updated Information about visiting the Quilotoa Lagoon in Ecuador, from how to get there, prices, itineraries and frequently asked questions. The Quilotoa Lagoon (or Quilotoa Lake) is an extraordinary water-filled volcanic crater nestled among Ecuador’s central highlands. All Ecuador Hop buses traveling between Quito and Baños stop at a lookout point where you can take some photos of the lake before continuing to the next destination. Local communities near the Quilotoa Lagoon are great places to experience the traditional culture of the area, explore artisan markets or sample regional food. If you’d like to spend some more time at the Quilotoa Lagoon, we offer an extra tour to Quilotoa that you can easily add on to your Ecuador Hop pass. Keep reading in the Quilotoa Lagoon Tour Information section below to learn about what our tour includes and how to book it. The incredible Quilotoa Lagoon is one of the places you absolutely must see while in Ecuador! Read our guide below to discover how you can see this amazing volcanic lake for yourself. The easiest way to get to the Quilotoa Lagoon is to travel with Ecuador Hop. Our buses stop at a lookout point where you can take photos of this amazing volcanic lake. If you’d like to have some more time at Quilotoa, you also have the option of hopping off and taking our extra tour. 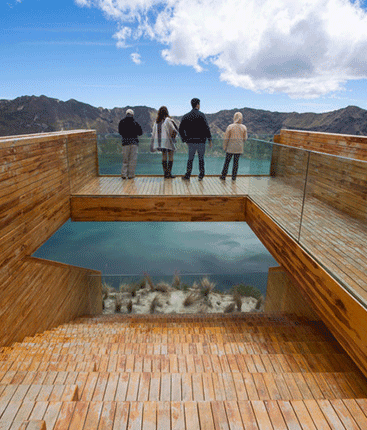 All Ecuador Hop buses make a stop at a lookout point where you can see the Quilotoa Lagoon and take some photos. 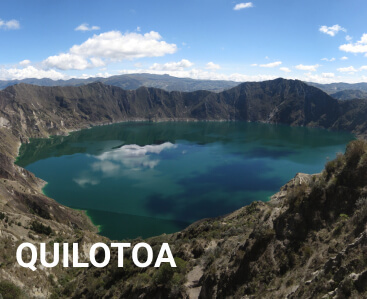 If you’d like to have some extra time to explore this stunning volcanic lake and visit some of the nearby communities, our Quilotoa extra tour is a great option! 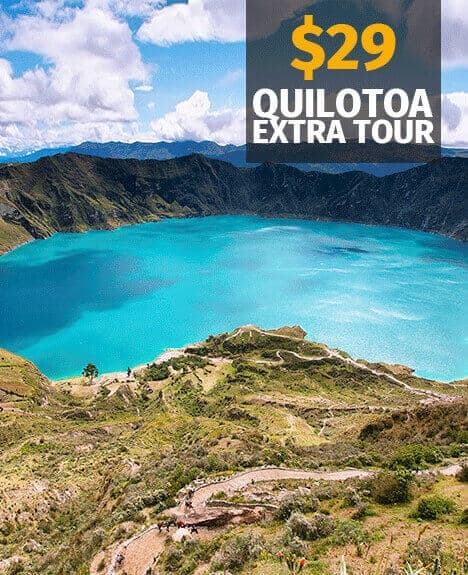 Hopsters who’ve bought a pass which travels from Quito to Baños (or Baños to Quito) can upgrade their pass with an extra tour to Quilotoa for just $29. 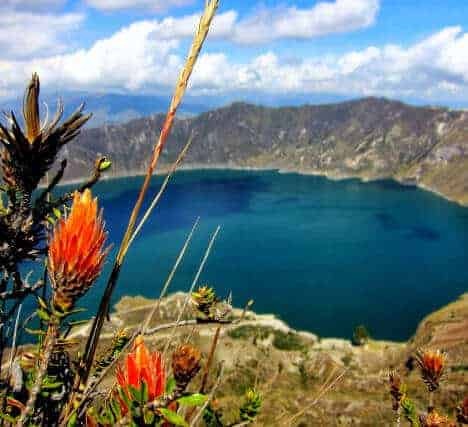 This tour will give you the chance to hop off and explore more of the amazing Quilotoa Lagoon before continuing to the next destination on the following morning. Guided walk to the shore of the Quilotoa Lagoon. Entrance taxes for Quilotoa Village. *There are many hostels and hotels in Quilotoa, just ask your Ecuador Hop guide if you need assistance. Stop at the Chuquiragua Lodge in the foothills of the Cotopaxi Volcano to enjoy scenic views and an optional breakfast (if coming from Quito). Visit to the Quilotoa Mirador lookout point for breathtaking views. Guided hike down to the shore of the Quilotoa Lagoon. Free time to explore at the lake. Guided hike to the nearby community of Quilotoa. Afternoon lunch at a local restaurant. Visit local artisan workshops and museums or take a guided hike up to the extraordinary Shalala Mirador lookout point. The optional hike to the Shalala Viewpoint is highly recommended if you want to experience one of the best views around! 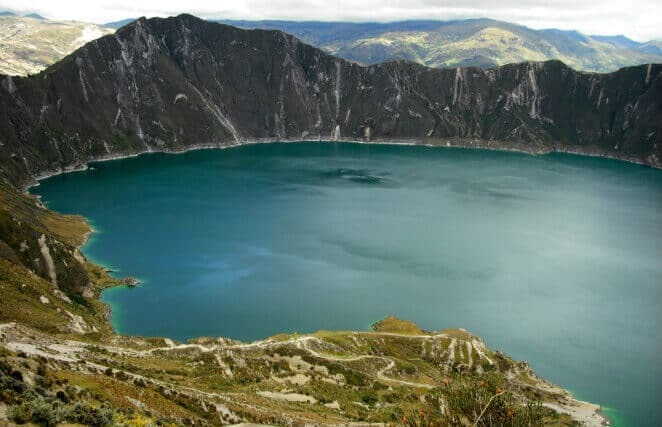 A tour of the Quilotoa Lagoon is a great way to discover the real Ecuador, visit some local communities and spend some time in one of South America’s most beautiful places. If you’d like to add this extra tour to your itinerary, simply speak to your Ecuador Hop guide to book your spot! Hopsters traveling from Quito to Baños have the option to hop off at Quilotoa and begin the tour of the lagoon the same day. After the tour, you’ll stay at your hotel or hostel in Quilotoa Village before continuing on towards Baños the next morning (ask your guide if you need help finding accommodation). Hopsters traveling from Baños to Quito have the option to hop off at Quilotoa in the evening and stay the night at a hotel or hostel in Quilotoa Village (ask your guide if you need help finding accommodation). 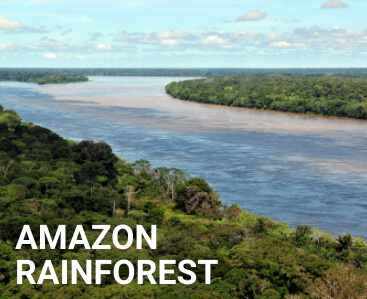 You’ll take the tour of the lagoon the following day before continuing on towards Quito. Quilotoa is the furthest west of any of mainland Ecuador’s volcanoes. 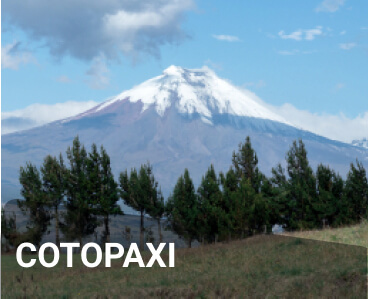 The volcano consists of a 3 kilometer wide caldera, or volcanic crater, surrounding a 240 meter deep lake. Quilotoa’s only historically verified eruption occurred in 1280, and was one of the largest explosive eruptions in history. The lake’s brilliant turquoise color comes from a combination of different minerals dissolved in its waters. You can book an extra tour to the Quilotoa Lagoon directly with your Ecuador Hop guide. How do I book a hostel or hotel? Your Ecuador Hop guide will be able to help you book a hostel or hotel in Quilotoa Village if you haven’t already arranged accommodation. At nearly 4,000 meters above sea level, Quilotoa Lagoon is definitely at high altitude. 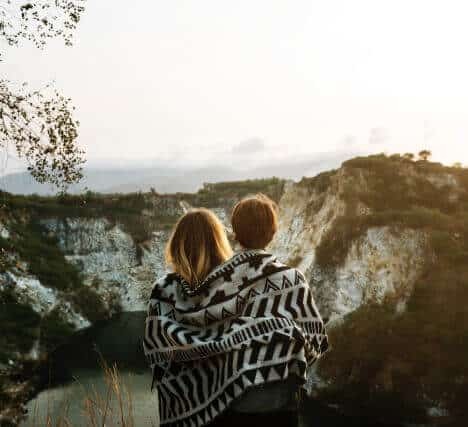 If you’ve already been traveling in the region for a while, your body will be acclimatized and you shouldn’t have too many issues with visiting Quilotoa. If you’re coming from a lower altitude or plan to go directly to the lagoon after flying into Quito, it’s best to carry some medication for altitude sickness just in case.